Saving the environment is not an option anymore – it is a matter of survival. And it is no longer the ‘prerogative’ of a few but the responsibility of the collective. This is also not the time for apportioning blame on any body or anybody for the degradation of the environment. Individuals, organisations and governments should be jointly accountable and responsible for their actions (or lack of them). We have to protect what is left of our planet, especially for our future generations. We surely do not want to be responsible for ‘apocalypse now’ – for our own premature curtain call. A lot of damage has already been done. The pyramid of life of Earth is indeed on very shaky ground. But there is still time to make amends and to plan our cities and the coming hyper-urbanisation accordingly. For example, reducing energy use and/or using renewable energy will clearly help reduce air pollution and greenhouse gases. The less that the air and the environment are polluted, the more chance we have to reduce global warming, which is already playing havoc with the global climate. What man on Earth is failing to comprehend (since it seems that only seeing with one's eyes is believing) are the dangers arising from global warming – like the rising sea levels. Unless efforts are taken to arrest such phenomenon, we will surely be swamped. Going forward, obviously a forest cannot be (re)created in a day. So, while we protect what is left of it, consistent efforts have to be put in for planting more trees across the City. They will not only help preserve the natural environment, but also keep people healthy. “We are working to convert the Biodiversity Park into one of the best forests in the country. Many people from the City come here for a walk and get to feel its natural aura, ” concludes Lathika. Ms. Lata Vaidhyanathan, Principal of TERI School, says, “The adverse effects of the macro and micro climatic changes are severe. We clearly need to control the damage. While many of us are aware of the basics of environment protection, we don’t follow even these. In our School we teach the students the importance of environment protection and the benefits of planting trees. For us, every day is an environment day. At TERI (Institute), thousands of researchers are working on this sensitive issue. They are working on methods, technologies and processes on how best to recycle and reuse products.” The Principal of Amity International School, Vishakha Chitnis, says, “I appreciate the fact that EVS (Environmental Science) is a compulsory subject under the CBSE Board. This education helps even young minds understand that they need to protect the environment. 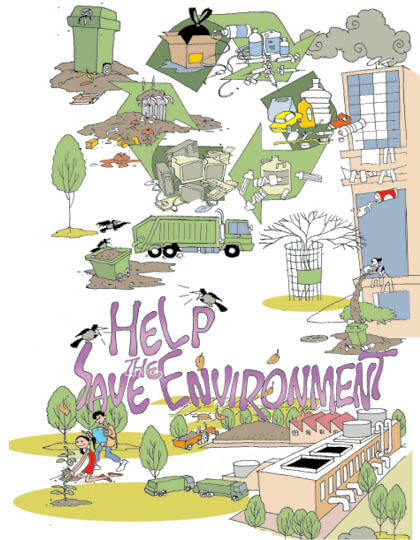 The good thing is that students are showing a lot of interest in, and appreciating for, the need to protect the environment – which will also benefit their own future.” In fact, in Gurgaon, students seem to be even more sensitive to Nature than adults. Most of them understand the value of preserving Nature and saving Earth from degradation. “To save our planet we need forests, plantations and water. They are important for all living beings - humans, animal and birds. It is important to ensure a proper ecological balance,” says a student of a Senior Secondary government school. For some it’s already the time to act – and, like charity, the action needs to begin at home. “Reusing and recycling many things, from newspapers to cans and scrap metals, will help protect our environment. Whatever goes to waste should be treated, and not left to rot and seep into the ground. We should all conserve electricity in all various daily activities, “ says Arpita, a student of Dronacharya Government College. The Environment Department in the State government has devised a few plans to help protect and preserve Nature. ”Traffic is the main contributor to air pollution and we are trying our best to control it. However, we also need to conserve water and, importantly, reduce water wastage. Steps have also been taken to dissuade builders from drawing ground water. We will also plant many trees; like in Chandigarh, they will be planted in a row. Along with DC, RWAs and NGOs will help in the planting of trees and managing solid waste materials. This will create more awareness as well as help develop greenery in the City. I admit the government works in a slow manner, but we have now started to seriously think about the environment,” says a department officer. The official adds that government schools now have eco clubs, which are funded by the State. These clubs are spreading awareness of the environment among the students, and are also undertaking various environment protection programmes. The State has also planned a rally from Jacobpura to the Biodiversity Park on the occasion of World Environment Day (June 5), to spread the message of environment protection, and the 3Rs – Reduce (use of natural resources), Reuse (products) and (use) Recycle(d) products. On a broader platform, the lesson is: what we can recycle, we should; what we cannot, let us not use; reduce usage of disposable products; use more paper products (as they break down better in the environment and don't deplete the ozone layer as much); stop using plastic bags; reuse brown paper bags to line our trash can; buy recycled goods; store food in reusable containers, instead of plastic wraps or aluminum foils; use more organic fertilisers; compost household waste; use recycled engine oil; and take public transport wherever possible. “Let us walk more and drive less to conserve fuel and prevent auto emissions,” says a professor of Environmental Science, Delhi University. We should avoid littering our roads and highways - and also prevent others from doing so. Littering is not just bad for the environment, it is also an offence, and carries heavy fines. Avoid burning dead leaves, as this creates significant air pollution; do not also put them out along with the trash, as this takes up unnecessary space at the landfills; instead, compost the leaves and debris. At farms, why can’t we regularly (as in earlier times) pull out the weeds, instead of using harmful herbicides? Finally, let’s teach our children to genuinely respect Nature and the environment, and work to protect, nourish and revive the one planet that offers a miracle called Life. On this World Environment Day, let us all take a pledge to save our Mother, and then make that pledge count every day, in every action we take. After all, Mother Earth will be what we make of it. The 3Rs - Reuse, Recycle and Reduce – need to start trending! It takes resources to manufacture and transport all products, even those made from recycled content. At the very least, energy is spent...and spending of resources leaves the Earth poorer. While we can continue to buy ‘new' (there is no Environmental Police - yet), let us remember that buying nothing is better for the Earth than even buying Green. There are exceptions, of course – like when switching from an energy-wasting to an energy-efficient model. Reducing is probably the toughest, as it means letting go of notions like bigger is better, new is better than old and that convenience justifies anything. When you shop, look for things that will last – and are useful and beautiful enough to please you for a long time. It’s ok if they cost a little more (initially).